Creating handcrafted clogs takes time and care. Long before Jackie’s clogs are sent to your door, each pair is thoughtfully conceived by Jackie using artisan methods, quality materials and paying exceptional attention to detail, making them comfortable to wear and walk in. The first step in the design process is the concept and each new design is mocked up on a special mould in the shape of a human foot, called a last. Once the design is finalised it is realised in full-grain leather. The leather parts are cut by hand and the edges are thinned using a skiving method to make sure the seams don’t rub against your feet. 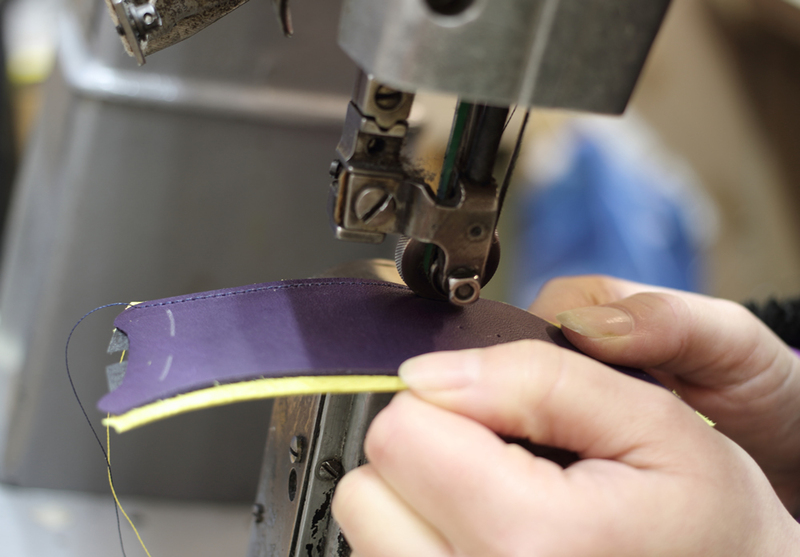 The lining and reinforcements are put in place and strong nylon thread is carefully sewn by Jackie’s faithful and traditional Singer 236 machine. 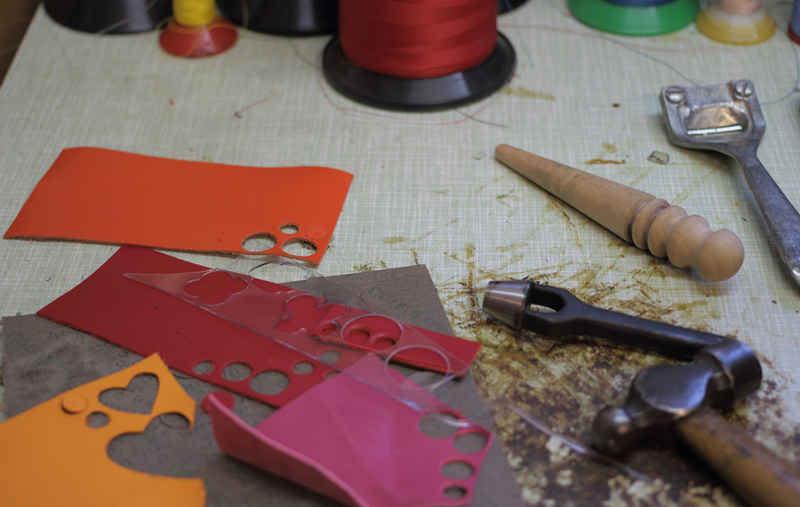 At this stage the eyelets are attached and grooving patterns are applied. The wooden sole has a special curve to provide rock and balance, making them easy to walk in. They are sanded and waxed to reveal the natural grains of the beech wood. Then a coat of sealant makes them weather resistant and gives a smooth polished finish. An anti-slip resin rubber sole is nailed onto the wood using brassed escutcheon pins. The next step brings together the leather upper and the wooden sole. That’s when Jackie’s 20 years of shoemaking experience comes into play to differentiate her clogs from other traditional clogs. The last goes on top of the wooden sole and the upper goes over the last. Heat and moisture are used to mold the upper into the shape. A firm tug by skilled hands completes the shaping of the upper ensuring a perfect fit and unbeatable comfort. 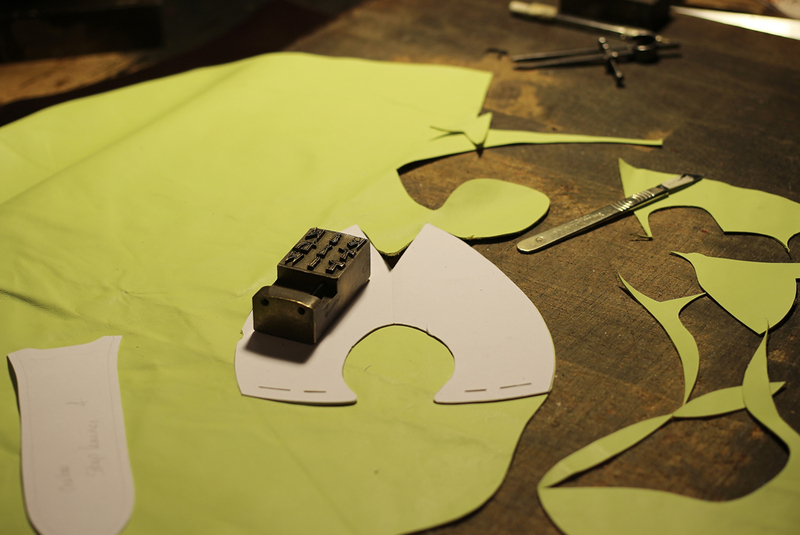 The leather upper is secured in place and the finished clog is left to dry and settle into shape. Finally the finishing touches are added, the laces are threaded in and the clogs are wrapped in a lovely drawstring cotton bag before being packed in a rigid box, ready for delivery. From conception to production, every step and every single stitch is done with care and undying love for artistic craftsmanship. And the result is one of a kind, functional and contemporary footwear created to reflect your original individual style.